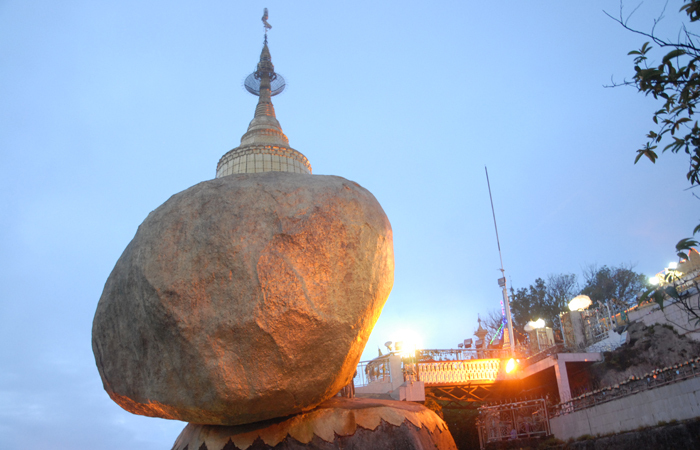 GOLDEN ROCK Kyaikhtiyo Pagoda, over 1100 m above sea-level, is situated about 160 km (a 5 hour drive) from Yangon. It is one of the most visited places in Myanmar. This mystical pagoda stands on a gilded boulder precariously perching on the edge of the cliff and it seems to be standing against the force of gravity. According to legend this boulder was placed here in ancient times by the supernatural King of the Deva, a powerful being in Burmese mythology. 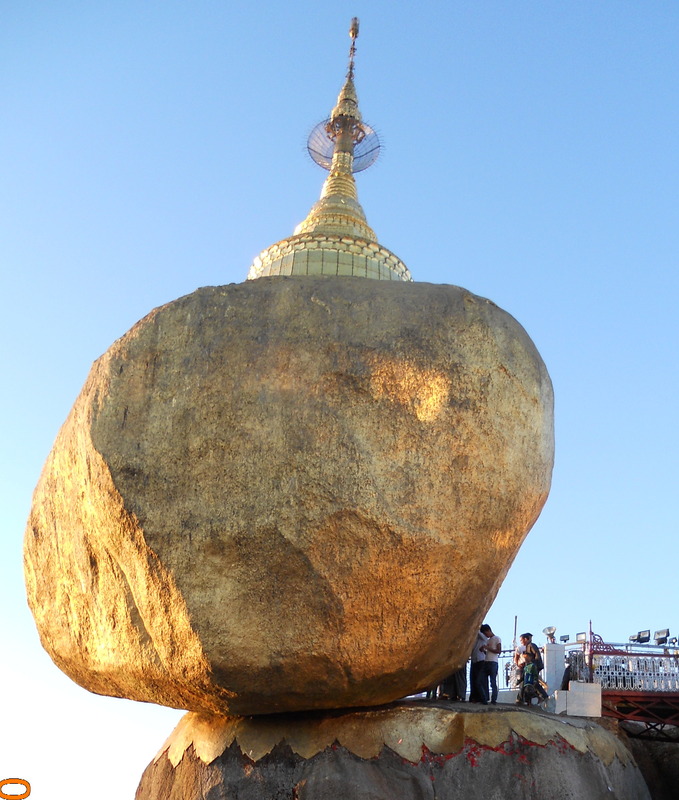 Some say it is kept balanced by a delicately placed Buddha's hair inside the stone. Pilgrims make the 11km climb up the hairpin path from the base of the mountain (Kinpun village) but you can take a one hour drive up in one of the authorized shuttle trucks to a terminus near the top. The trucks are fitted out with bench seats in the open trays, a typically Myanmar adventure. At the terminus, you commence a 45 minute hike up to the pagoda. There are numerous hotels at the foot of the mountain and one for tourists at the top, which affords majestic views from this amazing vantage point. PHA-AN Pha-an, the capital of Kayin state, is situated on the broad brown Thanlwin River, easily reachable by road from Yangon, or by ferry from Maylamyine, the Kachin state capital. This small town boasts many historical and religious sites among great natural beauty. Mt Zwekabin, (722m) is a revered landmark, offering panoramic views of the countryside. The many lofty limestone crags around the town contain caves of historical, religious and geological interest. Springs, hidden lakes and thousand year old Buddha carvings are there for you to discover. Pha-an is renowned for producing many venerable monks, and you can visit the famous Kyaukkat monastery and pagoda while visiting the town. MAWLAMYINE Mawlamyine is the fourth largest city in Myanmar situated 180 kilometers east of the nation's capital across the Gulf of Mottama at the mouth of the Thanlwin river. It is the capital of Mon State with a population of about 400,000 people. Formerly known as Moulmein, it was once a major port and the administrative capital of British Lower Burma. The town's signature landmark is Kyaikthanlan pagoda built in 875 AD and thought to be the site from where Rudyard Kipling wrote his famous poem, 'The Road to Mandalay'. The Thanlwin bridge, the longest road and rail bridge in Myanmar is the most prominent landmark in the area. It stretches a distance of 11,000 feet over the Thanlwin river connecting the country's south eastern region with Yangon. Mawlamyine is generally considered to be off the main tourist trail for most travellers to Myanmar but the town does have a charm of its own with its rich history, buildings with colonial style architecture, World War II era wooden buses, and its close proximity to the infamous Siam-Burma "death railway", making it a fascinating place to visit! MYAWADY A bustling border town on the eastern side of the state, Myawady is the main gateway for traffic and travellers to and from Thailand. The isisthe road route into Thailand for Myanmar's valuable gemstones. The town boasts a famous pagoda, the Shweminwon, guarded by two impressive mythical lions, and a large monastery.